The double-blind peer review process is central to publishing in academic journals, but it also relies heavily on the voluntarily efforts of anonymous reviewers. As academic journals have proliferated in the political science (and the social sciences more generally), journal editors have increasingly become concerned that scholars feel overburdened with requests to review manuscripts. To evaluate the degree to which scholars suffer from the resulting “reviewer fatigue,” we empirically evaluated the reasons scholars offered when declining to review for the American Political Science Review, the top journal in the field. We found that almost three-quarters of those who responded to our requests agreed to review. Just over one-quarter declined. Of those, about fourteen percent explicitly stated as their reason the large number of requests to review. Hence, a substantial proportion of those who are asked to review respond positively. 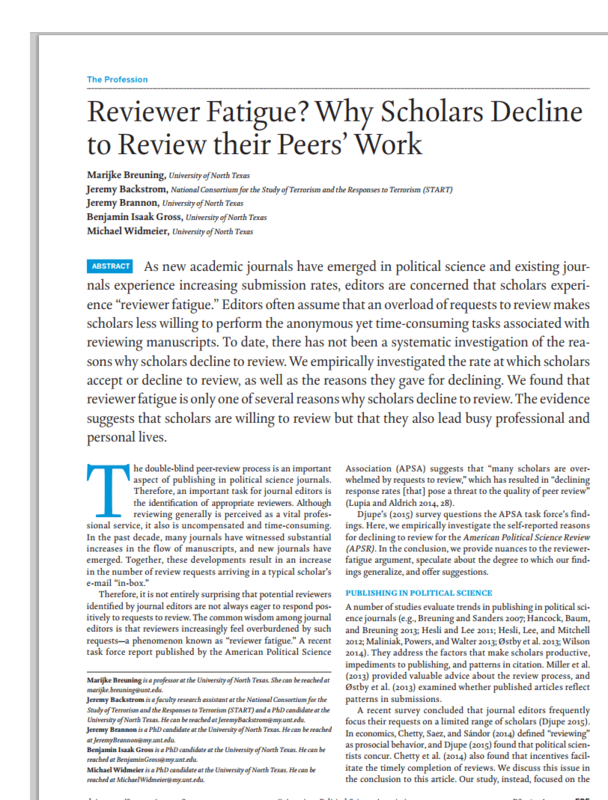 For those who decline, reviewer fatigue is only one of many reasons. Our findings suggest that scholars face many demands on their time and substantial workloads overall.